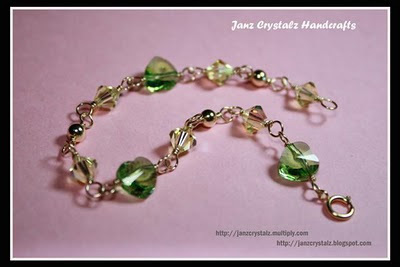 I recently made a simple bracelet using Swarovski Crystals peridot heart and bicone beads. Buzz me if you want the same item! Very Pretty! Mine is up HERE. Add na kita sa Ym accept na lang para magtalk ta about etsy. I like etsy since they have many customers and it is easy to navigate. nice creation Janz, keep it up. We have the same passion talaga.